Today was drizzly all day long. It was the best. I'm sitting here now listening to the drops ping off the patio cover. 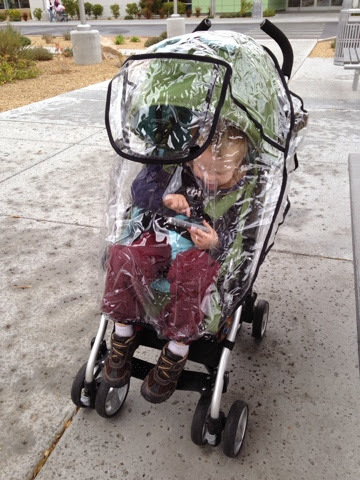 I took The Boy on a walk, using the stroller rain cover thingy that came with the stroller. We've avoided using the plastic dome for like 3 years- that seems like an accomplishment all on its own. And hey, I have noticed how rather normal the past few days have felt. I have not had a rocking-fetal-position-cry in some days! That's either progress or some pretty deep denial. We had to put things on pause to wait what will seem like an eternity to get another opinion from a different specialist and hope we can get some more options onto the table. Our table is lacking in the option department. So anyway. Logically, I cannot freak about because we don't have all the information. A healthy person would not be running worst case scenarios in their head all day. HEY YO, I may be inching closer to normal person behavior! Either that or my panic reflex is related to my anger management issues? I have rage issues, but! Upside! It's very flash-in-the-pan kind of anger. I get VERY UPSET. And then move on and/or forget about it. Husband can certainly attest to this. The early marriage years must have been so confusing for him. I get so mad and start yelling. But then like 30 mins later, I'm curled up and sipping some hot cocoa acting perfectly fine. When I ask why he's flinching when I move he looks at me like I'm crazy. So anyway. (Yep. Another so anyway) Perhaps I am done panicking? Maybe I needed a week of fresh hell freaking out and now I can be the strong silent type? (stop laughing, you) Maybe we'll be revisiting the panic next month. (stay tuned for that circus) Until then I will go on long walks to the park, take Little Man to the library, and do some frivolous Home Goods shopping. I panic when I don't have answers, so I know where you're coming from. And I snap pretty easy (except I don't get over it quite so easy, life with me is grand). I hope your panic is over, at least for a little while! It's a painful way to go about life.